As much as we like to think we are training when we hit the bouldering gym, most of us are performing or even just exercising. Remember that training is planned and progressed and controlled carefully in order to achieve desired results. Performance is all about showing what your training has produced. 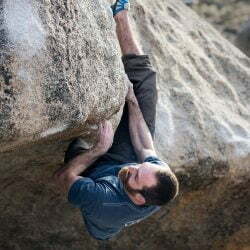 In climbing this usually manifests in redpoints, fastest times, high placements at comps, or just going into the gym and trying hard boulders. Exercising is anything that increases your activity level at all – a walk, a random weight training session, even Zumba. Although there can be some crossover between the three (especially at the early stages of a career) the act of just going and doing the sport will lead you to an “ok plateau” where your systems aren’t overly taxed and you can spend large portions of the year at a level that feels pretty good. The problem is that pretty good gets pretty boring in a hurry. A significant problem is that many of us get to a level that at some point in our early climbing we decided was “pretty good.” In route climbing, plateaus usually fall at the cusp grades: 12a, 13a, etc. In bouldering, it’s usually the grade that someone we climbed with that was better than us could do. They are the climbs that, when we are fit enough for them, we feel like we are “in shape.” This becomes problematic in the long-term because we see it as an endpoint to training and will often let off on pushing ourselves when we really could go further. When you are stuck, and have been climbing at the same level for several seasons, you need to start to look at what is holding you back. More often than not, boulderers can start looking at their basic strength. Can you hold a lock off? Can you roll into a crimp? Can you press out on the top of a problem? Route climbers need to look at economy of movement, general fitness, and, of course, basic strength as well. 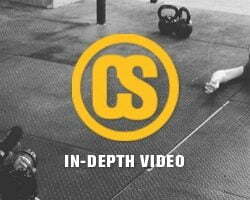 For years, I have written about various methods of increasing strength. From a basic strength training template, to increasing general grip strength, to integrating hangboarding with high-load weight training, I have tried to build session templates and suggestions for climbers training anywhere from home, to the gym, to living in a van down by the river. We also have several different programming suggestions for getting the most out of a season. We build programs that alternate between a strength focus and a power focus, ones that alternate daily between strength, power, and capacity, and even full-season programs. Chances are you’ve tried a few different plans. You’ve spent some time on the campus board or working volumes or doing weight circuits, but things still aren’t playing out. Assuming you have a fairly fixed schedule, here are three suggestions for breaking through to the next level. The key to successful training is to follow a simple cycle of Plan > Train > Test > Perform. In many ways it doesn’t really matter how you structure your training at first, simply get to the gym or the boulders and try to push yourself harder session after session. Follow your plan for a month, then test yourself to see if you are better or not. Frequently, we do this by trying to send hard projects, but you can also look at how many problems of a certain grade you sent, how long you can deadhang a certain edge, or your total volume of routes in a week. 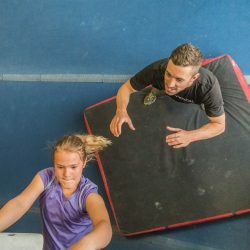 Your performances should be sport-specific – as soon as you start training to master a specific test (such as single finger strength), that test is no longer valid to tell you whether you are getting better at climbing or not. The better you plan and record your training, the better you’ll be able to see what works, what doesn’t, and what is missing. Change your expectation of what happens in a season. Too often, we hope for top-level performances every time we go to the gym or the crag. The reality is that if you are anywhere near your limit, you will have fluctuations in your ability to perform, both on a weekly level and on a seasonal level. With this in mind, make adjustments to your performance goals. During times of the year that you are feeling heavy or weak, you can dedicate time to learning specific techniques or developing specific facets of your training. When you are feeling great, break away from your favorite circuits or styles and try some new things while you are at peak fitness. Find time in your training logging to note the fluctuations and plan to make the most of both the highs and lows in upcoming seasons. 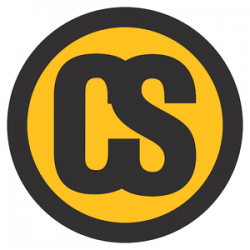 VMax: Simple, what is the hardest boulder problem you have climbed ever? Recent VMax: To get you out of living in the past, what is the hardest problem you have done in the last 8 weeks? This is a key metric, and if you aren’t within a couple of grades at all times, you probably are allowing too much fluctuation in your fitness. VSum: The total number of problems by grade you did in a session. V grade is not special, just easier to calculate with. Increasing this number is an indication of greater capacity and can be a good number to chase if you are heading out for a bouldering trip or getting ready for comp season. Average V: Take your VSum and divide it by the number of problems you did in a session. Pushing Average V tends to force you to rest more and try harder in each session. Effort: How hard did you try? Did you give a “gold medal” worthy effort, or did you quit. I, myself, have been getting 2-3 of these per session and am actively pursuing improving this number. This is a better metric for limit bouldering than almost any other. A simple phase shift is often all it takes to start progressing again. Take a month, track only Effort, or VMax, or simply start writing down your plan and its results and it’s astonishing how quickly things can change.